Travelling north to Flensburg on the Schleswig-Holstein-Express (the SHE) one evening in May 2010, I was chatting with four passengers heading home to the Rum capital of the world, talking about break-ups, broken marriages and partners cheating on them, when we suddenly found ourselves taking off from the ground. To think that most of the German state is flat consists of mainly farmland and coastal areas, to go from travelling on the ground to travelling in the air in a matter of seconds is like Eliott and E.T. flying in the air by bike. Yet the sound of metal to metal contact, especially when going over the steel towers revealed that whatever we were crossing was huge, the spectacular view of the lights of the town below and the body of water covered in emerald green lights was gorgeous. After going through the steel truss mechanism, we made our descent in a curly-Q fashion before touching the ground and stopping at our next station. Our conversation had stopped in favor of the structure’s admiration, a sign that homage needed to be paid to a gigantic symbol that bridges the past with the present, the lover on one place with one in the other, and the impossible with the reality. Especially the last one is what describes the Rendsburg High Bridge, spanning the Baltic-North Sea Canal in Rendsburg, located between Hamburg and Flensburg. The bridge was the masterpiece of Friedrich Voss, who had built two other structures along the Grand Canal at Hochdonn and Kiel as well as numerous others in the northern half of the country, concluding the two-span arch bridge at Friedrichstadt. It took 1.5 years to build the main attraction along the canal, which after 104 years, it still serves as the anchor that makes the Grand Canal and Rendsburg the place to visit. What Voss did with the bridge was unthinkable, impossible and even insane in the eyes of many locals during that time. 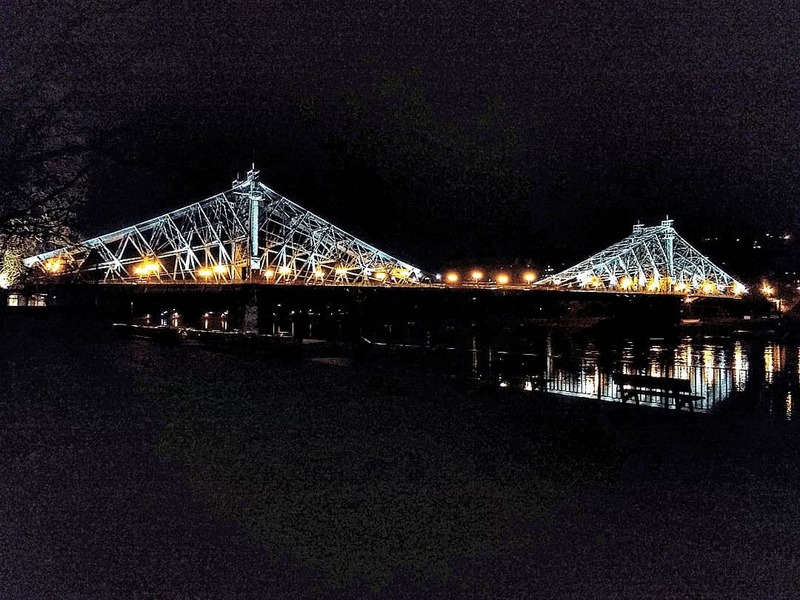 While steel trestles and a through truss design were his signatures for long-span structures like the aforementioned bridges, Voss needed a main span that would carry both horse and buggy (and later cars) as well as rail traffic. Henceforth as one of the feats, Voss chose the cantilever Warren span, whose roadway would serve rail traffic connecting Hamburg and Neumünster to the south and Flensburg and Scandanavia to the north. Hanging from the main span is the transporter span, which even today carries cars, bikes and pedestrians across the canal between Rendsburg and Aldorf. The transporter operates four times an hour in both directions during the day and takes 4-5 minutes to cross, half as long as when crossing the entire bridge via SHE. Even more unique is the north approach. Already in existence was the train station for it served rail traffic between Kiel and Husum, the problem came with how the approach span should descend from 50 meters above water to just over zero. This was where Voss referred to the history books and chose the loop approach. Using the Hastings Spiral Bridge as reference, the loop approach provides travelers with an opportunity to gradually glide down from the bridge, making a circle of 360°. The 1895 bridge over the Mississippi River was the first bridge to feature this loop approach for engineers and bridge builders at Wisconsin Bridge and Iron Works had the problem of the bridge extending into Hasting’s business district, which already had numerous buildings and traffic at that time. Therefore, the south approach consisted of the loop approach, thus encouraging cars to glide down into the city center like a marble. The problem was similar with the north approach, as it consisted of much of Rendsburg’s city center and housing area, combined with remnants of the old canal and the harbor area connected with the new canal. Therefore, Voss and his men devised a plan where a loop approach would feature first a series of steel trestles at the height of between 40 and 50 meters above water level, followed by earthen berms with concrete arch spans crossing main streets, after the descent of 40 meters. A Warren deck truss span crosses the rail line as it approaches the end of the loop. The total length of this loop approach alone is 4.5 km. The area the loop encircles consists of housing and therefore was later named Schleife. On 1 October, 1913, after 1.5 years of work, Voss and 350 of his men from the bridge-building firm C.H. Jucho of Dortmund completed the work, and the bridge was open to traffic. The bridge and transporter complex has operated almost unaltered ever since, sustaining minimal damage in World War II. The bridge was rehabilitated with rust protectant being added to the steel bridge between 1993 and 2012. The rail line was electrified in 1995, which resulted in the portal and strut bracings of the through truss span being lifted. Instead of the two-rhombus portal bracing, the main span now had A-frame portals, high enough for trains to pass through. Sadly though, the transporter portion of the bridge is being replaced even as this article is being reproduced for this page. On 8 January 2016, the transporter collided with a ship as it was passing underneath the bridge. The boat operator and another passenger were injured in the wreck. After thorough investigations by the local authorities and the Ministry of Transportation, it was concluded that the transporter could not be salvaged and was therefore removed from the bridge. A replacement replicating the original transporter is currently being constructed and should be installed by 2017/18. I had a chance to visit the bridge again in 2011, this time filming the crossing of the bridge and its transporter, but also following the path of the bridge from the start of the loop approach on the ground to the main span. While I never got a chance to see the Spiral Bridge as it was torn down in 1951, the Rendsburg High Bridge is nothing anyone has ever seen before. It is amazing just to be in a small suburb that is encircled by the loop approach, listening to trains cross it on an hourly basis. Its tall and towering trestles cannot be missed when travelling through Rendsburg. But the main span is just as amazing, for it has a total height of 68 meters, visible from 20 kilometers, making it one of the tallest structures along the Grand Canal. But I also noticed that the bridge with its wonderful work of art has not yet been recognized on the national and international scale. With the Vizcaya Bridge being nominated as a UNESCO World Heritage Site in 2013, the Firth of Forth Bridge scheduled to be nominated in 2015, the Rendsburg High Bridge Complex should be considered another UNESCO site as well because of the engineering feats that Voss accomplished in building this superstructure but also because the bridge still functions as a normal crossing of its kind today, just like it did when it opened to traffic in 1913. This is something that has made Rendsburg famous and makes it one of the wonderful works of art in Schleswig-Holstein, Germany and central Europe. Already it was given the Historische Wahrzeichen der Ingenieurbaukunst in Deutschland Award (Historic Recognition of the Works of Engineering in Germany) in 2013, on its 100th birthday. Chances are, more accolades will follow for this iron lady, whose total length of 7 kilometers (2,400 m main span) still makes it the longest railway bridge in Germany. To close this documentary about this bridge, the third and most important part of the Tour along the Grand Canal, there is a saying that applies to any bridge enthusiast. You are never a true pontist unless you visit at least a couple key engineering works. In my book, one should really pay homage to the Rendsburg High Bridge. It is an engineering work of achievement that is underrated and something that awes every engineer to this day. Every engineer has his creative talents, which Voss had when building this bridge. It has withstood the test of time and is still a work of art one should see, when visiting Germany. It is hoped that it will one day be a UNESCO site. It will eventually for it deserves this honor. You can view the photos of the Rendsburg High Bridge via facebook site. Click here to have a look at every aspect photographed during my visit in 2011. This bridge was used as a logo for the Bridgehunter’s Chronicles from 2011 until its retirement and replacement with the current logo in 2015 using another Schleswig-Holstein bridge in its place, the Fehmarn Bridge. This is what the Rendsburg variant looked like.